Sterling Silver Sitting Kitten Figurine Highly sought after by collectors this adorable kitten figurine appears as if it will purr and brush up against your leg any second. Sitting down with its head slightly tilted to the side it seems like it looks you straight in the eye wherever you go with its adorable gaze. A very detailed workmanship showing every hair and whisker on its body. 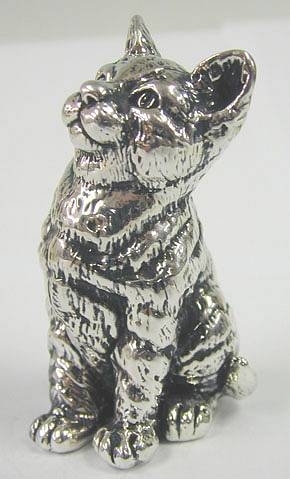 This figurine was made in the electroforming Method. Measurements: Height: 3in. / 7.6cm. Length: 1.8in. / 4.57cm. Width: 1.3in. / 3.3cm. Weight: 62.6gr. / 2.01oz. Marks: 925 for sterling silver.